Getting distance from a rug helps. When I returned from Wales and looked at Lady Sunset again, I was still not satisfied. The difference is that I now knew what I wanted to do. I wanted to go in with rainbow, but not as light in value as I had previously tried. This makes the line visible but more subtle so your eye isn't drawn to it instead of the eyes. This rug is about her eyes. You can see how I work as an artist. I have to hook in my idea and when it fails, I need to try something else. And I keep doing this until I really like it. I have never hooked a rug 'right' the first time. I am always making adjustments to my patterns and to my color and to my lines. I think this is why I love rug hooking so much. It is SO forgiving and generous. Some have asked about a pattern. Yes, I will be drawing it up. My patterns take so long to develop because I have to hook them first and make adjustments until I am satisfied with the lines. Now I will go back to the rug itself and trace it, working it into a pattern. Hope to get to it this week. I tweaked and bound, and here is the result. I altered some of the values in the left of the face and went back to a dark outline because I felt the eye needed the dark line to bring the viewer into the center of the face to rest. I don't know if I will keep the dark line or not. I'm sleeping on it for the week. A note to my readers: I am leaving for Wales today for five days. Not a vacation, unfortunately. It is for a professional conference on the Gospel of John where I am delivering a paper. So I will be back home next weekend and will begin posting again at that time. Well, when I got done with Sol Invictus and laid it down on the floor and took a picture of it, all I could think was "my gosh this is the ugliest thing I have ever rug hooked"! What was wrong? I decided it was two things. The dark outline around his face and the awful petal rays. Was it supposed to be a flower or a sun? So out came the dark outline and the petal rays, and in went rainbow outline and rays following the colors on the face. I also went away from straight linear hooking and pebbled the rays like the background. I am loving pebbling, and may have a hard time going back to linear hooking. I've renamed it Sunrise Sunset. Anyway I like the result. Although it is still not my favorite rug, it taught me a lot about color, value and pebbling. I am still not sure about the darker values of the green on the left side of the face, so I may still do a little value tweaking after I bind off the edges. Marita asked to see a picture of the backside of the pebbled area. Here it is. The hooking is flat with no crossovers, but non-linear. 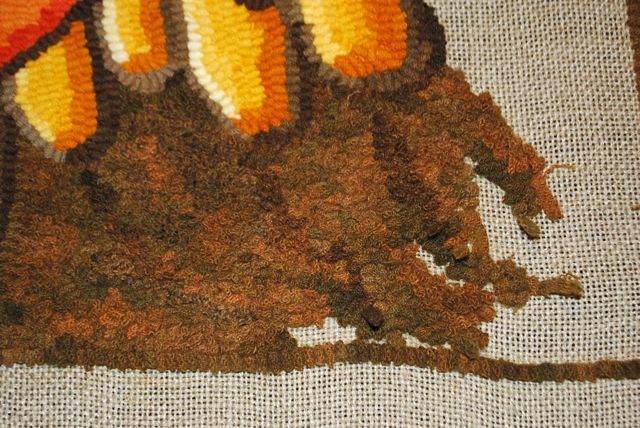 I started hooking the background of Sol Invictus by hooking in curved lines and filling around them as we normally do, using four textures I overdyed with Fincastle Brown 141, the same color I'm using in the eyes and around the rays. But the linear background competed with the sun face. So I ripped it out and began to play around with non-linear hooking and came up with a technique I'm calling 'pebbling' because the way the loops are arranged remind me of pebbles on the bottom of a riverbed. It is very simple, based on the concept of the 'random walk' or 'drunken walk'. The loops are hooked non-linearly and randomly, although not jumping around or crossing over like in waffling or pearling where spaces are left between the loops and filled in with another color. With pebbling, each loop touches the previous one, but is not hooked in a line (or a circle or a curve which are hooked linearly too). There are no crossovers on the back. So here are pictures of how I pebbled the background, hooking with loops staggering next to each other. I worked small random areas and kept filling in with the pebbling technique until the area was complete. I absolutely LOVE the look and think that this may become my favored technique for hooking backgrounds. I might have to experiment with using this technique in motifs as well. After I saw how beautiful the effect is, I began to wonder why we are always looking linearly, why we are taught to do this. I imagine that it has to do with rug hooking's history as a craft imitating rugs that are created on looms or machines where lines are the only way to create tapestries. But we don't have to be restricted by lines! Hook randomly today! To say the least, I did not finish Sol Invictus for the Kirby Hook In's Celestial Challenge. So I continue to work on the piece. It is inspired by the angel face mosaic that was recently uncovered in Istanbul, in the famous mosque Hagia Sophia. 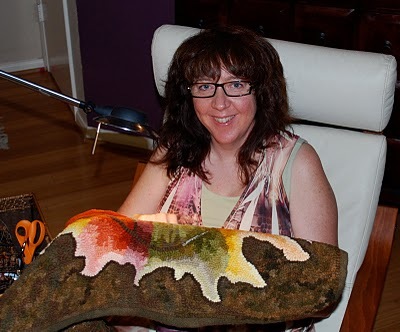 I am working the piece from several colors in my Goodfellow color family, the family that is based on the yellow dye formula Goodfellow Yellow 105. I also used some strips of Moorland Moss 106 dapple dyed wool around the eyes to get a variegated effect. I'm out to lunch on the background, although I think it will be dark and some overdyed textures. I'm thinking Fincastle Brown 141 at the moment (the dark color tipping the rays). I am at the point of tweeking the face, so I just converted my color photograph to black and white so I can see the values better to make sure that they are what I want them to be. If I see something too light or too dark I will pull out the strip and replace it with another value. I hook by thinking about values, where the light and shadow is on the object I'm hooking. I try to cluster my colors at the same time I mix them so I'm using the same value of different colors here an there (like in the forehead). Immediately I see that there are two strips under the right eye that are too dark and one over the right eye that is too dark. So I will replace those with lighter strips. I turned in the last index at midnight on Tuesday. Been trying to catch up on sleep. I need to turn to write a couple of presentations for a conference the week before Thanksgiving. So I won't be posting regularly until after Thanksgiving when I will catch up with the Ten-Minute round-ups and start thinking about Christmas projects I want to do. Things are so hectic I am even going to miss guild this Saturday - because I have to continue writing my presentations. In the meantime while I have been working on putting together a PowerPoint show for a paper I am writing on astrology and ancient religion, I came across this fantastic antique painting of the face of an angel that was uncovered in the Hagia Sophia mosque in Istanbul. Wow. I have to hook this into a rug as the face of the sun or moon. Complete with terrific colors and border designs. Can't wait to get started, but it will have to wait until after Christmas.